Toronto Star - "As Awareness Grows, Risks Shrink"
The Hinsdalean - What to kids and families need to know about food allergies? Carlsbad Patch - "A Rockin' Attitude About Food Allergies"
NewsObserver - "You'll have a positive reaction to his tunes"
North County Times (San Diego) - "Canadian gives students musical lesson about allergies"
Kingston Whig Standard - "Singer Nuts over Allergies"
Allergic Living - "Kyle Dine, Allergy Minstrel"
Living Without - "Food Allergy Musician - Kyle Dine inspires kids to reach their dreams"
Hype Foodie - "Food Allergies Rock with Kyle Dine"
Good.is - "The Raffi of Food Allergies - Inside the Allergic-Kid Economy"
GetAllergyWise.com - "Interview: "Food Allergies Rock!" 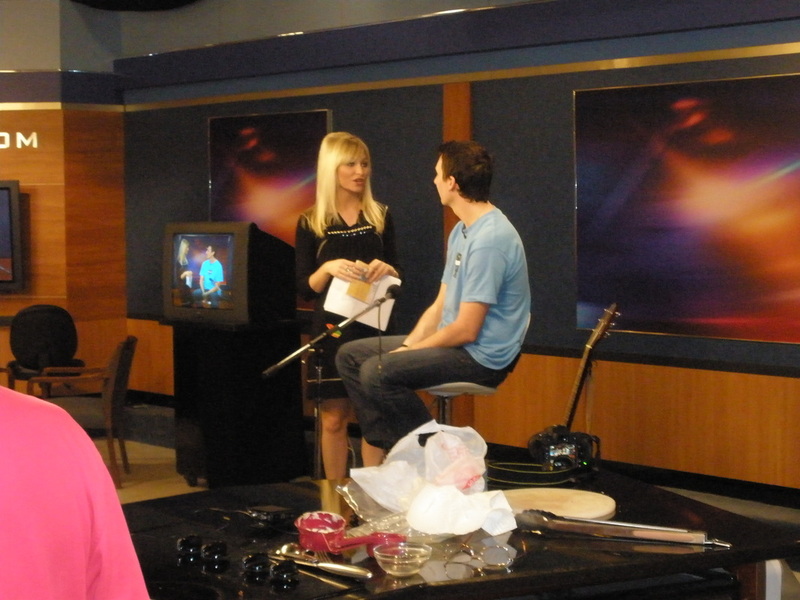 Musician Kyle Dine"
Eatnutfree.com - "Kyle Dine Rocks!" TasteofAllergyFreeLiving - "Food Allergic Kids Rock in Cary"
Neocate.com - "Food Allergies Rock! Wait, what?" Ian's Natural Foods - "Food Allergies Rock. Let Kyle Dine Explain How." 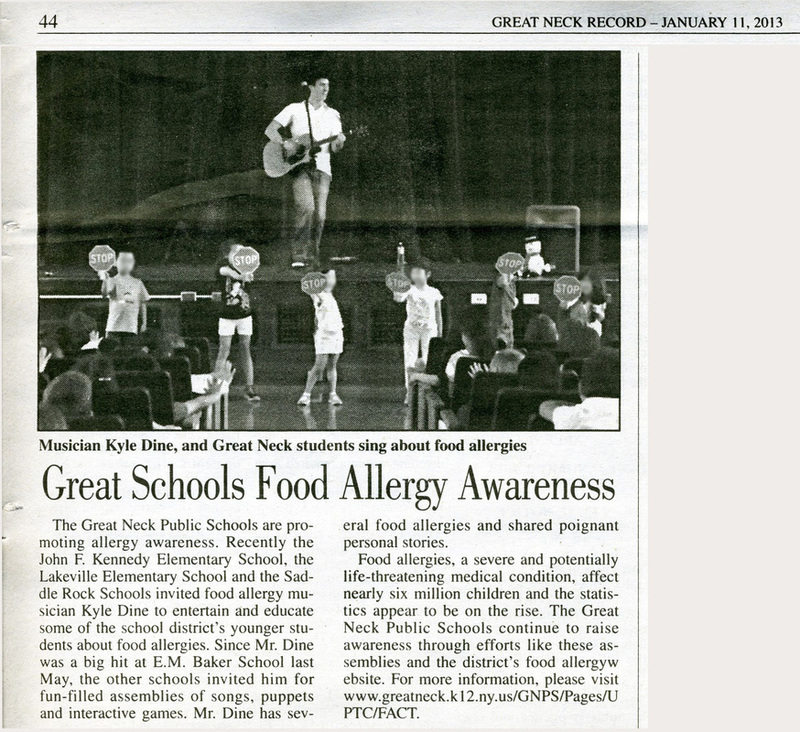 Food Allergy Education Network - "Thank you for a fabulous food allergy awareness week"
Fox News Charlotte - "Singer/Songwriter Kyle Dine Makes Food Allergies Cool"
Click2Houston - "Songs teach students about food allergies"
WBKO Bowling Green - Interview and performance of "I Wrote a Song About Allergies"
NPR Austin, TX - "This Musician Has a Unique (And Maybe Lifesaving) Message for Kids with Food Allergies"
AllergySmart.net - "Interview with Kyle Dine"
Interested in interviewing Kyle for your blog or other media? Contact him today.